Jonathan Blow is the main dude behind the really nifty video game Braid and he’s been making a new game called Witness. Both of these games explore storytelling in new and interesting ways that push the medium of video games to the edge. It’s really neat to see how an independent developer can really push the boundaries and be quite successful commercially. Edge magazine interviewed him recently and in the interview he talks about everything from storytelling to industry issues to his thoughts on Minecraft. Here are some snippets I found to be particularly interesting. Here he talks about puzzles and linearity, I enjoy his take on fake puzzles because I think we all get frustrated by them. Is The Witness playable from start to finish yet? Yeah, but I recently broke the ending again! I moved a building and didn’t really hook the design back up again. But you can play it from start to finish in about ten hours or more. Especially if you want to be a completionist, because you don’t have to get everything to finish. It’s a choice. As soon as you get any five of seven [challenges], you can get access to the end. It lets me keep the puzzles really hard sometimes because I don’t expect players to solve them all. In many modern linear games it’s as if puzzles have been beaten out of them. They’re still there, but they’re fake puzzles. It gets to be almost a stupid time-wasting activity a lot of the time. To me a puzzle is something you might never figure out, but a lot of modern game design just isn’t conducive to that. If you come to a puzzle in a linear game that you can’t get, then you can’t play the rest of the game you just paid for. On the business side the most inspirational thing he says is in regards to funding and profit (of all things). 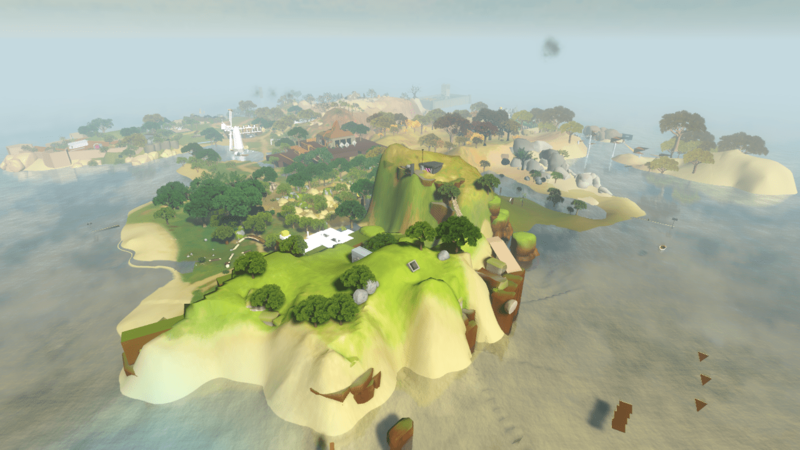 You’re self-publishing The Witness – what do you need for it to break even? We have a two million dollar budget, but to make that money back this game doesn’t have to sell as many as Braid did. So it’s not super risky. I don’t think there’s much competition with a game like this. But I think there’s a lot of people who want to play a game like this. Even if it’s ten per cent of gamers, to an indie developer that’s huge. As a small developer you have certain freedoms. Embracing the possibility of not selling any games and not making any money allows you to do things that bigger developers would never be allowed to do. Even if a publisher said they would fund such a game as this, after a while they would stop you. Try and justify The Witness to a publisher who doesn’t really play games!